The Interceptor Javelin is the quickest available in Anthem, but can be tough to master. 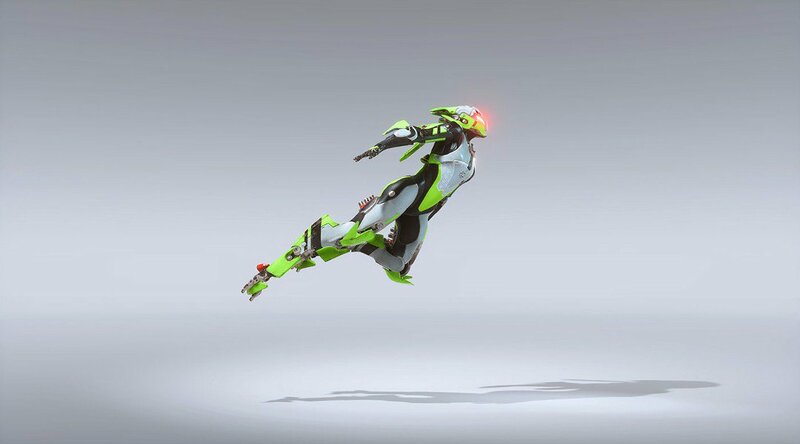 If you're after a Javelin that puts speed and style above everything else in Anthem, then look no further than the Interceptor. In our Anthem Interceptor Javelin guide, we'll be compiling all the details you need to know about the unique exosuit, including detailing the best Anthem Interceptor build, so you know which items you should be kitting out your Javelin with. But if you instead need any other information relating to BioWare’s new game, you’ll want to check out our full Anthem guides hub. Here you can find a complete story primer for the game, as well as all the details you need to know about the three additional Javelin exosuit classes available. As we said at the top, the Interceptor Javelin is the quickest, but also the smallest, exosuit class in Anthem. The Interceptor is excellent for forging ahead and scouting out new territory, getting in up close and personal to enemies in the blink of an eye, dealing some quick damage, and getting out of reach before they can react. Every Javelin class in Anthem has two available weapon slots, and the Interceptor is no different. However while the Interceptor can equip almost every type of available weapon in Anthem, it can’t equip heavy weapons like rocket launchers and flamethrowers, as these are exclusive to the Colossus class. All four Javelin classes in Anthem have a unique melee ability, and the Interceptor has the “Double-Bladed Daggers” ability. When used, this ability lets the Interceptor deal out rapid damage with multiple hits from the two daggers, in a quick flurry of slashes. Other Javelin classes in Anthem like the Ranger have one grenade ability that they can switch up, but the Interceptor works slightly differently. You can equip one ability from the three sections we’re about to detail just below, and switch them up between missions. Seeker Glaive - Throws out a single sharp projectile which seeks the nearest target. Acid Bomb - Sends out a single grenade which explodes, showering nearby enemies in acid. Cryo Glaive - Launches a projectile which locks onto a target, and freezes it in place. Spark Dash - The Interceptor dashes forward, leaving a trail of electrical energy in its wake. Star Strike - Charges an enemy with energy, which eventually explodes after a short delay. If you can kill the enemy before the charge goes off, it deals increased damage. Plasma Star - Throws out a shuriken charged with energy at a single enemy. Nova Strike - Sends out a duplicate projection of the Interceptor Javelin, which attacks any enemies it encounters. Tempest Strike - An attack on a single target, that can stun smaller enemies. Corrosive Spray - Sprays out a continuous jet of corrosive acid which damages all enemies it touches. Target Beacon - Marks a single target, which then takes increased damage. If the target is destroyed, the marker changes targets. Rally Cry - Removes negative status effects from all nearby teammates. This Ultimate Ability for the Javelin exosuit is known as Assassin’s Blades,” and can supercharge the exosuit. For a limited time, the Interceptor can carve through enemies with increased speed using the twin daggers. The Interceptor is lightning fast, deadly up-close, but has a paper-thin shield. Success is based on quick, close attacks followed by speedy retreats to recoup and recharge. It's tough to get right, but use the loadout below to maximize your damage. In terms of gear, the Venom Bomb is essential. It douses the enemy in acid, priming them. The cool thing about this is that a melee attack will detonate them after a few hits. Use Tempest Strike to get into this attack combo state quickly, as it can be triggered at mid-range. The Traget Beacon is great as it chains from enemy to enemy, taking away any buffs they may have and allowing you to focus your attacks. In terms of Components, the Interceptor is very flexible. We've seen success with any that increase Acid and Melee damage. The Blade Inscription, for example. As of right now, this is everything that you need to know about the Interceptor Javelin exosuit in Anthem. Now you can continue ahead to either our Anthem Colossus Javelin guide, or our Anthem progression guide for more. Tagged with Action,	Bioware,	Blockbuster,	Guides,	PC,	PlayStation 4,	Role Playing Games,	Shooters,	Xbox One. "We Have a Saying: At Ubisoft You Always Have a Second Chance"
What happens when you're locked in Mortal Kombat with yourself? Mortal Kombat 11 Review What happens when you're locked in Mortal Kombat with yourself? The Friends of Ringo Ishikawa Is a Coming of Age Beat 'Em Up With A Lot On Its Mind Part-River City Ransom, part-Persona, part-Yasujirō Ozu: can there ever be a better mix? "The Fact That We're Still So Afraid of a Topic Like Weed Instead of Murder Simulators [...], It's Shocking" THIS WEEK IN THE BUSINESS | Console news abound, games are banned and restricted, and big companies continue to get even bigger.